Gorgeous keepsake baby blanket in soft white polar fleece and matching baby bib featuring adorable embroidered newborn baby foot prints on both, these gifts can be personalised with an embroidered name, monogrammed initials or a little message to make them completely unique. Gorgeous keepsake baby blanket in soft white polar fleece and matching baby bib featuring adorable embroidered newborn baby foot prints on both, these gifts can be personalised with an embroidered name, monogrammed initials or a little message to make them completely unique. Designed and made to order especially for you by Amys Gifts. This beautiful soft babys blanket is quality made from anti-pil polyester polar microfibre fleece fabric of good quality with overcast blanket stitched edges and is lovely to touch and cuddle into. This beautiful soft babys blanket is quality made from anti-pil polyester polar microfibre fleece fabric of good quality with overcast blanket stitched edges and is lovely to touch and cuddle into. Choose the fleece blanket size you want, a pram blanket measures 100 by 75cm or a larger cot blanket measures 150 by 100cm. Easy to machine wash at 30C-40C and fast to air dry or can be tumble dried on low. The bib is a good quality 100% double layer cotton pullover bib to help keep clothes dry and free from stains and is easy on and off. The bib is machine washable and can be air or tumble dried on low and gently ironed on reverse if needed. Both items are proudly made in the UK. 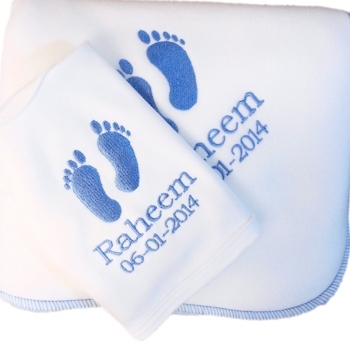 We will professionally embroider any initals, name or little message on the blanket and bib, for example Emily 25.05.08. Please select from the options and fill in a name or little message, please check spelling. You can choose what colour embroidery thread too! Add that unique touch and make this a really special gift for baby.